The Vocal Library High Voice. Arranged by Richard Walters. Vocal Collection. Play Along. Softcover Audio Online. 48 pages. Published by Hal Leonard (HL.740221). ISBN 0634060287. 9x12 inches. Book/Online Audio Edited by Richard Walters The Vocal Library. The demand for literature in Spanish is a reflection of our changing American culture. Here are twelve songs, in two keys, that can serve as an introduction to art songs in Spanish for a voice student. International Phonetic Alphabet is included for each song text, as are translations for study. Contents: DE FALLA: Asturiana • Cancion • Preludios • GRANADOS: El mirar de la maja • El majo timido • El tra la la y el punteado • OBRADORS: Con amores, la mi madre • Del cabello mas sutil • Corazon, porque pasais...? • La mi sola, Laureola • MEXICAN FOLK SONGS: La paloma blanca • Mi sueno. December 15, 2007 A must-have! pronunciation, for every song. It's a great investment for any budding vocalist. February 16, 2007 Heat of Spain! 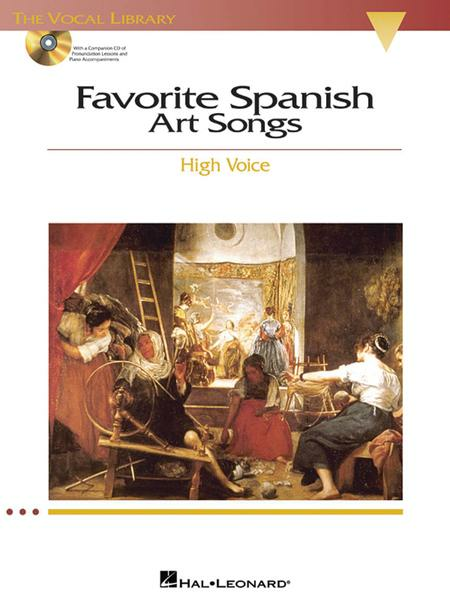 A very attractive selection of Spanish Art Songs, complete with a CD of pronunciation and piano accompaniments. It is just slightly perverse that the pronunciations given are South American Spanish when all the composers are from European Spain. 26 of 125 people found this review helpful.